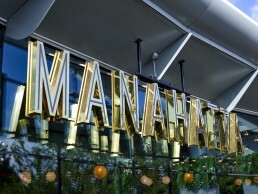 Already having two Manahatta sites, Fusion By Design were asked to enhance the original scheme, evolving the design and creating a suitable bar for the student demographic. The final scheme increased the cover numbers by infilling the open mezzanine on the second floor which allowed for large feature curved booths. We were also able to introduce relaxed, comfortable seating areas or chill out zones. These have flexible seating for group bookings and also space for dancing when the DJ arrives and the party starts. The rear terrace area was also updated and an exciting oasis created, to maximise the al fresco drinking. 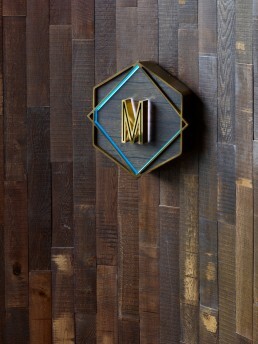 The Manahatta brand is based on the ‘Beat of NYC’ with exposed painted brick and graffiti feature graphics on the walls. 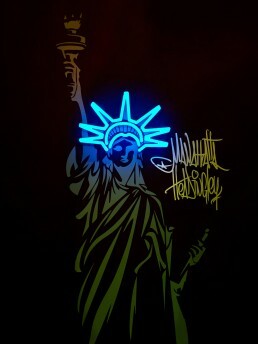 Nods are made to the big apple with a feature neon Lady Liberty and a Don’t Walk/Dance flashing pedestrian sign for those ‘instgram’ moments. Relaxed comfortable seating areas echo a New York loft, with mid century style seating, graphic prints and leather seats in soft muted colours. These all compliment the bold brand peacock coloured booths and banquettes. Exposed filament lamps and glass shaded coloured pendants provide a warm glowing atmosphere for all day dining and into the night for cocktails. The roof terrace was transformed into an urban jungle with faux planting and festoon lights with bright new furniture in brand colours to maximise the use throughout the year.